Passionate people get things done. Not only that, but they get things done with greater efficiency. Take Adirondack Mountains guide and chef George Crum: After a customer complained that his french fries were too thick and soggy, Crum sliced the potatoes thin, fried and salted them, and sent the customer the new plate. The customer loved the crispy dish, and soon the popularity for Crum’s “Saratoga chips” grew.1 Like Crum, Aaron Carlson of Uptight Goods has identified an efficient solution to a food-related problem and has taken steps to propel his passion project forward. Carlson started Uptight Goods because he enjoys adventuring outdoors and is therefore very familiar with the challenges of camping. One aspect of camping he didn’t enjoy was drinking instant coffee: he disliked the taste and the outdoors limited his options. He also noticed that two of the biggest problems campers face are keeping provisions away from bears and keeping trash to a minimum. 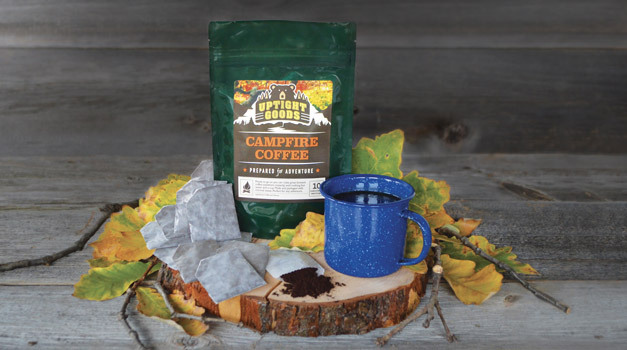 To help combat these problems without taking away from the camping experience, he is launching his first product, Campfire Coffee: a delicious, one-cup coffee packet. The compostable wax packets are easily disposed of in a campfire but won’t clutter the forest for the next 2,000 years—saving the environment and animals from harmful waste. When Carlson shared his story with us, we could easily see this was a passion project, and it quickly became a project we are passionate about too. We both agreed Kickstarter would be the best platform to gain instant interest in the product. First, we worked with Carlson to update the Uptight Goods logo. We were conscious of keeping the bear reference because they are the inspiration for the name—keeping your campfire goods up and away from bears and other animals that will go through a campsite in search of food. We then created a label design to incorporate the new Uptight Goods logo into the Campfire Coffee packaging. Once the logo and product designs were in the final stages, we put our skills to the test and hit the trail. We set out to create a video to capture Campfire Coffee in action and show potential consumers and Kickstarter supporters just how easy it is to prepare. With Carlson as our trail guide, and enough DEET to ward off any other thirsty creatures, this project raised the bar on “onsite video shooting.” We got to taste Campfire Coffee as it was meant to be: with boiling water straight from the fire and into the mug for a fresh, all-natural cup of joe. It’s projects like these that remind us why we do what we do. We’re a passionate team, and when we work with passionate brands, the end result is always better. Carlson knew he needed to share his big idea with fellow nature enthusiasts and future consumers and trusted us to help him make it happen. Thanks to our partnership of passion, we could create the goods while Carlson perfected his product in the test kitchen. We’re excited to see what other Uptight Goods Carlson has in his backpack. Until then, we’ll be sipping Campfire Coffee straight from the office microwave, helping our clients with their passion projects. If you’re interested in Campfire Coffee, check out the Kickstarter page.